Blogging isn’t as confusing as most people think it is. When I first learned how to start blogging about 3 years ago I knew nothing about blogs or blogging or nothing along the lines. I found myself just searching “how to blog” eBooks and information which wasn’t as easy then as it is now. I have several blogs now that make me money and have come a long way since then. Picking and choosing your blog topic is VERY important. If you have something your very passionate for then go with and start your blog. Don’t pick something you won’t enjoy or don’t have much knowledge on the topic. It’s just going to make things difficult and be annoying for you. Having a lot of knowledge on a specific topic would be the way to go about starting a blog. If you’re unsure what you want to start a blog about take some time and think about it. Think about your hobbies, daily activities, or even a skill you have. If you have a topic on your mind don’t hesitate, start your blog now. You won’t regret it and might actually find it quite addicting. I’m going to highly recommended self-hosted and using the WordPress blogging platform. Every single website I own is using WordPress because it’s simply the best platform around with over 70 million downloads. You very well could start a free blog if you wanted to without spending a dime with blogger.com if you wanted too. Yes it’s a free blog but you don’t “own” the domain. Instead of having a blog “yourblogname.com” with blogger.com you would get a domain such as “yourblogname.blogspot.com” – looks unprofessional right? Not only don’t you own the domain but if you violate their “term of service” blogger.com will shut your blog down without notice. I know this because It’s happened to me before. I lost a lot of hard work I put into that site to. Thus, I don’t recommend using FREE blogging services for that reason. Also using FREE services to start a blog you don’t have complete control over your blog and limited to what you can do. Meaning limited to designs and plugins to customize your site as needed. On another hand if you self-host your blog you can choose your OWN personal website URL that is not taken such as .com, .net, .org and so on. They usually cost $10 per year but for a limited time you can get it FREE at Bluehost.com when you get your own web hosting plan with them. Website hosting is required to run a self-host WordPress blog and cost $4.00 per month almost about what a gallon of gas cost. You can get a domain anywhere on average for about $10. I prefer Bluehost.com because when you purchase a web hosting plan to host your WordPress blog they give you a FREE domain. Plus I prefer getting my domain and web hosting at the same place. Bluehost.com is VERY reliable and also have an amazing support team to help you when you need it. Also lucky for you they have a 1-click Auto Install for WordPress so it take less than 5 minutes to setup! 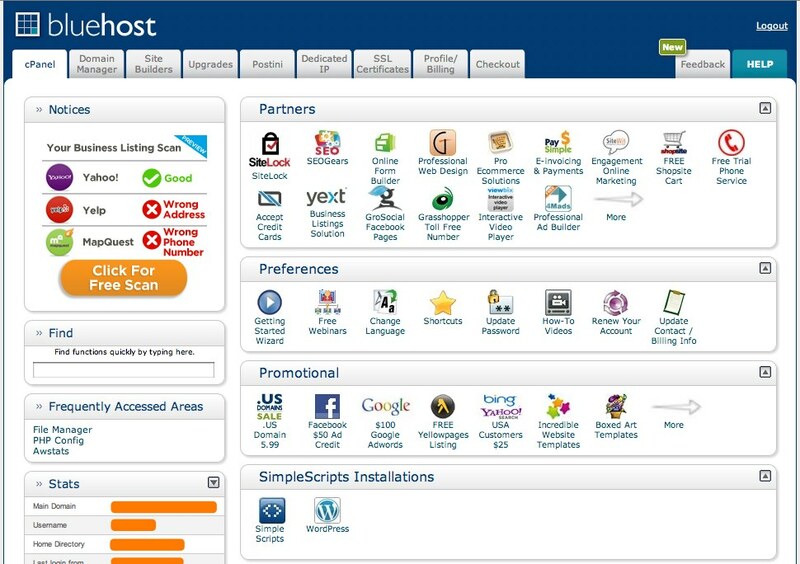 Inside here you can install WordPress with a simple click. You see at bottom under simple script installation the WordPress Icon? Click that and you will be ready to start your blog. Enjoy your blogging journey!